As we near 2017, marketers have to juggle more than ever. With quickly evolving content trends, hundreds of content and social media tools to evaluate, the delicate balance of internal and external resources, and many other competing interests—content marketing can get overwhelmingly complex. For some marketers muddled in the industry, frustrations are running high and patience is running low; however, others are beginning to follow a trend towards slowing down. 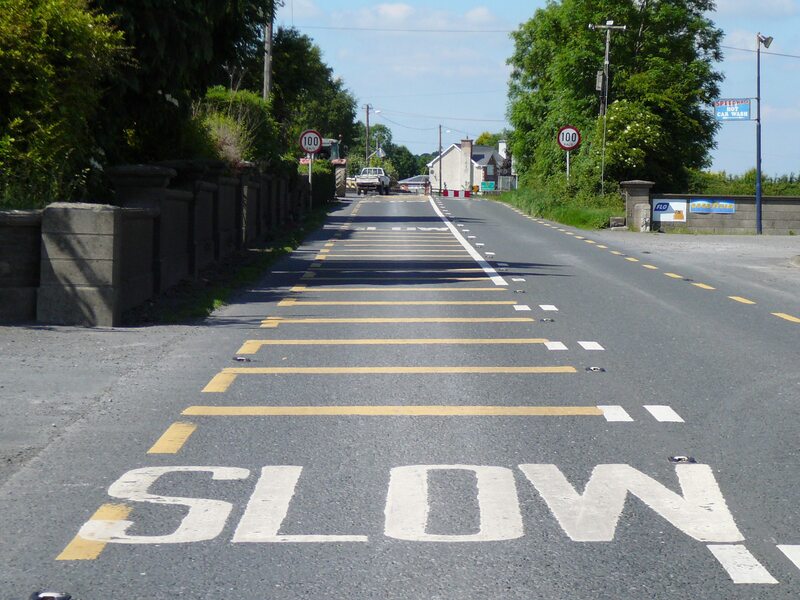 With influential marketers like Ann Handley suggesting slower marketing tactics and experts at the Harvard Business Review touting the importance of strategic, confident, and slow decision makers, perhaps it’s time to re-evaluate and slow down your content marketing as well. Learn how to slow down your marketing by assessing your organization’s marketing maturity, ensuring that your processes are efficient and stable, and measuring more of what’s important in order to improve and amplify your marketing efforts moving forward. There is an old adage that goes something like, “You have to crawl before you walk—and walk before you run.” In other words, you should master the basics before moving on to the more complex things in life. The same can be true of your overarching marketing practices. In order to better understand if your team is ready to tackle more advanced campaigns, onboard new employees, add new software tools, or scale your overall efforts, you need to take an honest look at where your team currently stands in terms of marketing maturity. This can help you determine if you have all of the pieces in place to successfully grow while also minimizing future headaches. 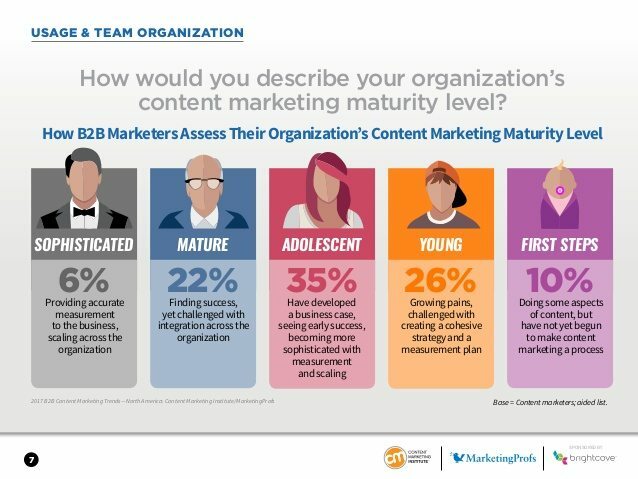 Roughly a quarter of B2B marketers would assess their content marketing as mature or sophisticated. Start by assessing how your team performs from ideation, execution, and into the measurement aspects across all of your marketing initiatives. This could be as simple as looking at how long it takes your team to tackle a project from start to finish, but it should also include the intricacies of how projects are completed. For example, think about the following when assessing your team. How well are you using your marketing channels to engage and build your audience? How is paid advertising performing over time? Think month over month, year over year, etc. How are you managing your marketing data and collecting feedback from your users? What sort of marketing assets have you accumulated? Is your organic search engine performance improving over time? How are your marketing efforts comparing to your competition? What is your overall confidence with your overall marketing efforts? Think about your processes from strategy to implementation to optimization, and into measurement. And ultimately—are you comfortable with meeting your goals? Marketing maturity can be a sensitive topic, particularly as you begin questioning any skills or expertise that your team holds. Keep in mind that the point isn’t to undermine how far you’ve come as a team—it’s to identify the areas that you need to concentrate on to improve and grow your future marketing efforts. Take a look at Adobe’s marketing self-assessment test to help you get started. The idea of cutting back or slowing down goes against the typical marketing mindset. While many marketers are interested in growing their team, campaigns, and audience as rapidly as possibly, doing so can actually hurt the team in the long run if careful consideration into your marketing process isn’t paid. For example, you may have a “tight-knit” or “rockstar” marketing team that can run circles around larger organizations in terms of execution, but if one team member goes on vacation, finds a new opportunity, or is promoted into another department—the team may not function as effectively because their expertise and processes weren’t properly documented and shared with the team and other departments. This is where real headaches and stress can begin to take it’s toll on your marketing efforts. In order to avoid this, be sure that your team documents their marketing processes as they go and shares their findings with departmental leadership and cross team as applicable. This can help surface process pain points and inefficiencies. Additionally, be sure to reassess any written strategic documents that you’ve already created, such as your content strategy, editorial guidelines, contributor guidelines, etc. This should be done regularly—consider hold quarterly meetings or biannually at a minimum. If you haven’t put the effort into documenting your marketing processes before, one of the best times is when onboarding a new employee. You’ll likely be concentrated on getting them up-to-speed with your team and teaching them your processes will likely be top-of-mind. After you’ve documented your processes, you will have a reference point to help you determine if you are operating efficiently. Consider the composition of your content team; i.e. editors, designers, copywriters, managers, etc. and how efficiently they can execute your content strategy. As a final tip, be sure to assess and document processes for your external resources as well. Consider how you find freelancers, manage 1099 contractors and content creators, or agency contracts, schedule of work, etc. External processes can also be a time sink and slow your team down. One benefit of slowing down your marketing is making sure that you are doing everything correctly. This means that you should be taking a closer look at implementing or improving your content measurement techniques to determine how well you are performing as a whole. Better understanding your content performance can help you earn more buy-in from leadership, determine where to invest your marketing resources, and help you identify new marketing opportunities before your competition. Get started by identifying both the short and long term goals of your organization. Hold meetings with key shareholders and department leaders to understand what goals the marketing department is responsible for achieving. When having these conversations internally, consider this an opportunity to manage shareholder expectations and set reasonable, attainable goals. This can help your team avoid being overwhelmed with daunting growth goals, which can damage productivity. Next, identify the key performance indicators (KPI) that your marketing department will be responsible for monitoring. This could be as simple as short term goals for individual content to more challenging long term goals such as increases in overall web traffic or lead conversions. Make a list of 5-10 KPIs to get started. Next, plan how you will measure success for each KPI. Think about any of the tools that you have available, such as Google Analytics, but also consider pulling data from the native channel when applicable. For example, Facebook advertising runs reports directly in Facebook and you can cross reference this data with your analytics platform. You don’t necessarily need another tool to combine the data, particularly in the lesser mature marketing teams. It’s important to note that your measurement processes not consume your overall marketing processes. Measurement should be a tactic that guides and assists your efforts but does not overly slow you down. Try not to get too caught up in your data. Additionally, it’s okay if you don’t know how to measure success with certain goals, that just means you have an area to research deeper before setting more aggressive goals. Campaign tagging using Google Analytics or Adobe Analytics. Customer journey mapping to understand your user better. User segmentation to provide more personalized content to your audience. Attribution modeling to better understand what content are effective. Data visualization and performance dashboards using Tableau. Have you considered slowing down your marketing efforts in order to achieve better long term results? Have you been overwhelmed with aggressive marketing goals that don’t seem realistic? How have you overcome these challenges? Put your answers in the comments section below or reach out to me on Twitter to discuss.